Provided photo MARK209 will perform a Christmas concert at Pleasant Hill First Brethren Church on Tuesday, Dec. 11, at 7 p.m. Provided photo Members of St. Boniface and St. Mary parishes spent many hours working on the Dresden Plate Quilt to be raffled on Dec. 1. Pictured from left to right are Janet Poling, Betty Elliott, Cindy Nelson, and Dolores Latham. TROY — Because this year is the 200th anniversary of the debut of the hymn “Silent Night, Holy Night,” First United Church of Christ’s worship series will celebrate the carol’s message over the entire season of Advent. The church is located at 120 S. Market St. in Troy. Services are Saturdays at 5 p.m. and at 10:30 a.m. on Sundays. • Dec. 8 and 9, “Glories Stream” – Joy. • Dec. 15 and 16, “Redeeming Grace” – Love. • Dec. 22 and 23, “Let Us Sing” – Hope. A Christmas Eve candlelight service will be held from 9–10 p.m. on Dec. 24. TROY — Rev. Don Crist will preach a sermon at St. John’s United Church of Christ, 130 S. Walnut entitled “Mary — Voice Activated.” The choir will sing “Sleep, Little Baby, Sleep” by Dan Besigand and Nancy Price. On Wednesday the Women’s Fellowship is having their Christmas party at 1 p.m. with a cookie exchange, white elephant event and auction for FISH. The Economic Justice committee will be meeting on Wednesday at 6:30 p.m. on White Privilege. A downtown landmark, St. John’s United Church of Christ, on the corner of Walnut and Canal since 1883, is an accessible church. Parking is readily available on the street. For more information call (937) 335-2028. TROY — First Lutheran Church invites the community to a festive Advent worship service at 9:30 a.m. on Sunday. Pastor Holst will preach the sermon “As The Holy Spirit Blows A Clear Path.” The family lighting the Advent wreath candle is Michaela, Bill and Jensen Anglin. Henrietta Baden will serve as lector. There will be Christmas carols and fellowship with coffee and cookies after the service. There is always a special message for the children. Sunday School for all ages. A staffed nursery is available. FLC’s Deborah Circle meets Tuesday, Dec. 11, at noon. Christmas Eve worship services are at 7 p.m. and 10:30 p.m.
Come as a stranger and leave as a friend. TROY — True Life Community Church invites you to Sunday worship service at 10:00 a.m. Christmas sermon series is “Life Beyond the Tree – The center of Christmas is Christ.” Nursery and children’s ministries are available. Christmas Eve candlelight service at 4:30 p.m.
Wednesday evening programs, 6:30-8 p.m., Children’s Classes and Life Group Meetings. TIPP CITY — Ginghamsburg Church will host a holiday season community blood drive Saturday, Dec. 8 from 8 a.m. to noon in the South Campus Chapel, 7695 S. County Road 25-A, Tipp City. Community Blood Center is celebrating the season by offering a warm gift of colorful holiday socks to everyone who registers to donate. Schedule an appointment online at www.DonorTime.com or call 1-800-388-GIVE. The holiday season is an especially challenging time of year for maintaining the area blood supply. If you must miss an appointment to donate please reschedule as soon as you can. GREENVILLE — On Sunday, Dec. 9, at 6:30 p.m., an ensemble from Indiana Baptist College in Greenwood, Indiana, will be performing a Christmas Concert at Greenville Baptist Temple. Featuring vocal, brass, woodwind, string, and handbell ensembles, the group will be playing several selections of Christmas carols. There is no cost to attend, and everyone is welcome. The church is located at 4689 Childrens Home-Bradford Rd., Greenville. 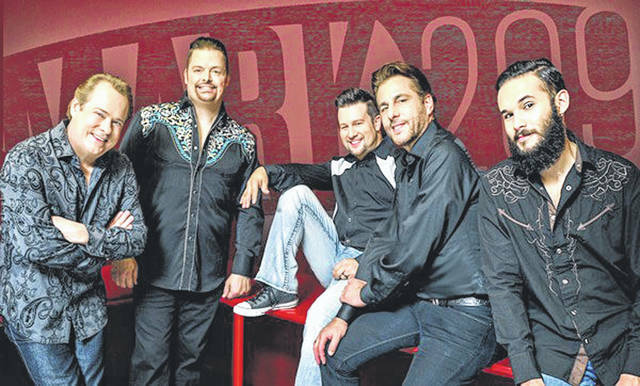 PLEASANT HILL — MARK209 travels extensively across the United States and is stopping at Pleasant Hill First Brethren Church on Tuesday, Dec. 11, at 7 p.m. to perform a Christmas concert. There will be a “love offering” to help bless and support their ministry. For more information about MARK209, go to www.mark209.com. TROY — Troy First Presbyterian Church will host a holiday season community blood drive Wednesday, Dec. 12, from 2-6 p.m. at 20 S. Walnut St. Community Blood Center is celebrating the season by offering a warm gift of colorful holiday socks to everyone who registers to donate. Schedule an appointment online at www.DonorTime.com or call 1-800-388-GIVE. PLEASANT HILL — The Pleasant Hill Ministers are sponsoring the annual Christmas walk between the churches of Pleasant Hill on Thursday, Dec. 13. There is a short program at each church. Refreshments will be served by the last church, a time for caroling and visiting. The walk begins at 6:30 p.m. at the First Brethren Church, and stops at 6:50 p.m. at the United Church of Christ, 7:10 p.m. at the Brethren in Christ Church, 7:30 p.m. at the Church of the Brethren and 7:50 p.m. at the Church of God. PIQUA — Congregation Anshe Emeth will observe Shabbat with their December service on Friday, Dec. 14, at 7:30 p.m. The service will be conducted by rabbinic intern Eliza McCarroll at the synagogue, located at 320 Caldwell St. in Piqua. Please call (937) 726-2116 with any questions. If there’s no answer, please leave a message and someone will return your call. WEST MILTON — Good Shepherd Lutheran Church in West Milton will present their annual “The Sounds of Christmas” concert at 7 p.m. on Friday, Dec. 14. Directed by Marsha Fischbach, and accompanied by Betty Lou Johansen, this year’s concert will feature guest musicians, Salem vocal quartet and Tara Iddings, cellist. Rounding out the evening’s program are the Good Shepherd Christmas Choir and the Shepherd’s Bells. This free concert will be performed in the sanctuary of the church at 1209 S. Miami Street, West Milton. Phone (937) 698-6036 for more information. PIQUA — Westminster Presbyterian Church, located at 325 West Ash Street in Piqua, will be holding a God’s Table Christmas Dinner on Dec. 15 from 11:30 a.m. to 1 p.m. It is a free meal open to public. The menu includes baked ham, orange glazed sweet potatoes, green veans with ham, a mixed fruit salad, rolls, assorted desserts, coffee, and fruit punch. PIQUA — Cyrene AME Church, located at 227 W. Ash St. in Piqua, is having a Christmas concert on Sunday, Dec. 16, at 3 p.m. The concert will feature their own Marlene Bolden Mitchell and God’s Children Choir from Grace AME Church in Bellefontaine. PIQUA —A Blue Christmas service will be held at St. James Episcopal Church, located at 200 High St. in Piqua, on Sunday, Dec. 16, at 4 p.m. The service will also involve other neighborhood churches, including Westminster Presbyterian Church, Greene Street United Methodist Church, and St. Paul’s Evangelical and Reformed Church. The service will recognize difficulties that people may have gone through and will include lighting candles in memory of loved ones people have lost, in memory of job loss or loss of health, in memory of one’s personal situation, and another as a reminder of one’s faith in God. The service will also include responsive readings and Christmas carols. COVINGTON — On Sunday, Dec. 23, Fields of Grace Worship Center in Covington will be hosting Splat Experience, a Christian performance art ministry that paints 8-by-8 foot canvases to a musical soundtrack. This will take place at both of the morning services that are 9 a.m. and 10:30 a.m. The ministry has performed around the world and with Grammy-winning Christian band, Casting Crowns. For more information, please visit splatexperience.com. or the fieldsofgrace.org or visit Fields of Grace on Facebook. TROY —The Valley Church invites the community to make the church a part of their families’ Christmas Eve traditions. The Valley Church meets on the Troy Square at 11 N. Market St. There are three service times available (4:15 p.m., 5:30 p.m., and 9 p.m.) to fit your holiday schedule. There will be music, complementary hot chocolate, festivities for the kids and even family photos. Join The Valley Church for a night to remember. Please visit www.thevalley.church to learn more. https://www.dailycall.com/wp-content/uploads/sites/30/2018/12/web1_mark209.jpgProvided photo MARK209 will perform a Christmas concert at Pleasant Hill First Brethren Church on Tuesday, Dec. 11, at 7 p.m.
https://www.dailycall.com/wp-content/uploads/sites/30/2018/12/web1_St-Boniface-quilt-raffle-CMYK.jpgProvided photo Members of St. Boniface and St. Mary parishes spent many hours working on the Dresden Plate Quilt to be raffled on Dec. 1. Pictured from left to right are Janet Poling, Betty Elliott, Cindy Nelson, and Dolores Latham.